Dynamic Health Laboratories’™ Apple Cider Vinegar contains “Mother” that is formed naturally in unpasteurized vinegar by the acetobacter. It’s made from USDA ORGANIC certified apples. 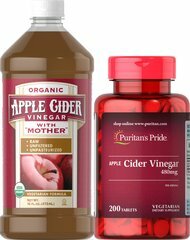 The “Mother” in Organic Apple Cider Vinegar with Mother is the dark, cloudy substance found in the vinegar formed from naturally occurring pectin and apple residues. It appears as molecules of protein connected in strand-like chains. The presence of the mother shows that the best part of the apple has not been destroyed. Vinegars containing the mother contain enzymes and minerals that other vinegars may not contain due to over processing, filtration and overheating. “Mother” is formed naturally by the bacteria in unpasteurized vinegar. Our organic coconut vinegar is made from coconut sap. It is low glycemic and contains trace amounts of naturally-occurring amino acids, minerals and vitamins. Coconut vinegar's color taste and consistency can vary from batch to batch. This does not affect the potency or quality.